Alsobia Dianthiflora (also called Lace Flower) is originally found in Mexico, Guatemala, and Costa Rica. Alsobia are exotic and beautiful houseplants. 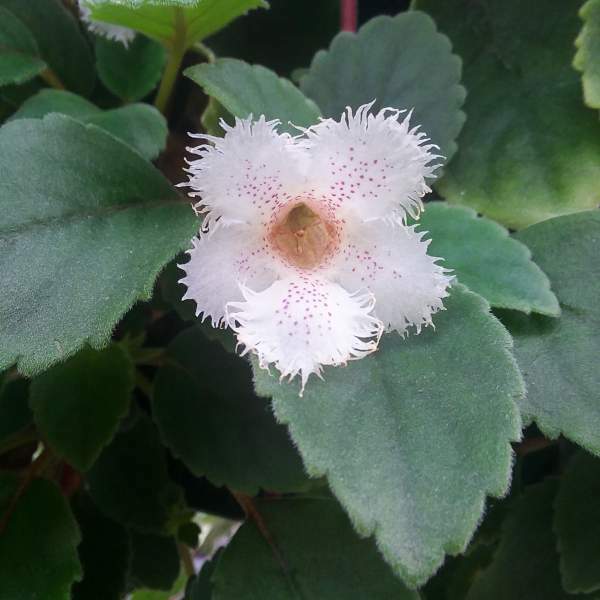 Alsobia have white, lace-like flowers that appear as plants become fully rooted in the pot. Your customers may like that Alsobia prefer heavy shade, so they grow well underneath gutters. Alsobia can be used as landscaping plants, and they also work well in small containers. For best results with Alsobia, we recommend using a balanced fertilizer on a constant feed program of 200 ppm N. Maintain a pH between 5.0 - 6.5. We recommend that you pinch Alsobia Dianthiflora Lace Flower 5-10 days after transplanting to your final container. Additional trimming may be necessary for the final shape of the pot. Alsobia should be spaced adequately to allow airflow and light penetration between the foliage. Usually 2’ centers on baskets will be enough. We do not recommend plant growth regulators for Alsobia. Control growth through proper pinching and trimming. Mealybugs and thrips are the biggest pest problems for Alsobia. Alsobia Dianthiflora Lace Flower are not prone to many diseases, but watch for botrytis while the days are short. This grey rot is usually associated with wet or humid conditions. You can prevent botrytis by allowing the plant to dry out between waterings, allowing for good airflow in your greenhouse, and spacing to allow the sun to penetrate to the soil level. The most common chemicals used to treat botrytis are Medallion and Banrot. Use them as a drench according to each label’s instructions. Pinch Alsobia Dianthiflora Lace Flower 5-10 days after transplanting to your final container. Additional pinches may be required to shape your final pot.